Mount Baker offers an interesting guided ascent for beginner-intermediate climbers on one of North America’s most sought after peaks. Referred to as Komo Kulshan, or the “Great White Watcher,” by the Lummi Indians, Mount Baker is the highest and most heavily glaciated peak in the North Cascades. Our route ascends the Coleman-Deming Glacier with challenging route finding and exposed by seracs, and large crevasses. Incredible views of the North Cascades, the border peaks to the North contrast with the imposing Black Buttes and Colfax Peak to the West. With its twelve active glaciers and breathtaking views, 10,781-foot Mount Baker provides a scenic and extremely rewarding mountaineering experience for both first-time climbers and seasoned veterans alike. Unlike the crowds found on popular Mount Rainier routes, your ascent is done in the untrammeled Mount Baker Wilderness Area. “I have never felt so alive in my life than during this trip! You allowed me to live a dream of mine with absolute safety and comfort. Our guide was phenomenal and the food was plentiful and literally gourmet fare. 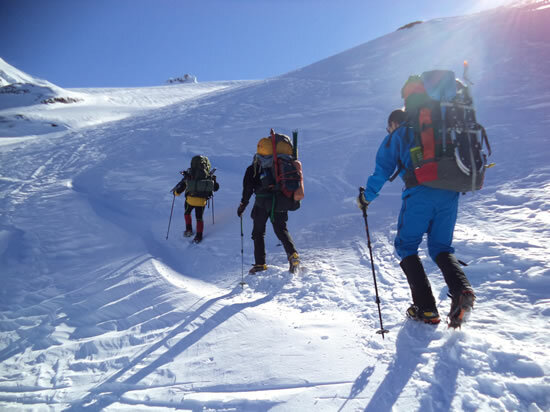 I loved it!” -Tim L.
Mount Baker is an ideal location to learn and review mountaineering and glacier travel skills, If it’s your first big climb, our goal is to teach fundamental, introductory skills, while giving you a hand’s on experience. The skills developed on Mount Baker will provide valuable insight into what is needed to tackle bigger climbs throughout the world. 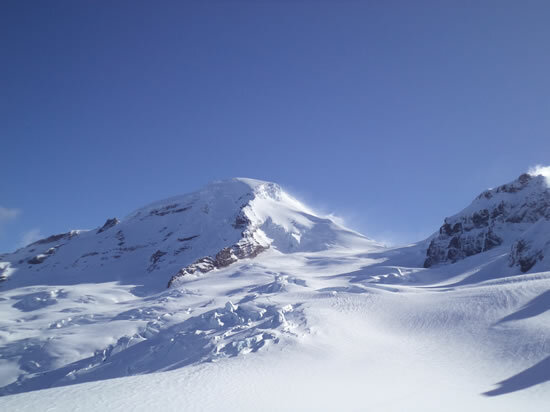 Mount Baker is a recommended conditioning or training climb for other Cascadian volcanoes, Denali, Aconcagua, and other high altitude peaks – and it's a great climb in its own right! 6am pick up from your hotel It’s about three hour drive to the trailhead and then another four hour hike to our camp. After setting up the camp and hot lunch, we will review basic climbing skills, equipment and plans for training day. After breakfast, we will conduct class that will cover use of ice axe and crampons, including self arrest. Next up, we'll cover snow anchors and travel in rope teams; we'll then take a lunch break. Our second lerning session will cover basics of crevasse rescue; anchors, team work and communication on the mountain. We will have an alpine start under headlamps, slowly making our way up the mountain. As we’ll climb higher, the morning light will open up the panorama around us showcasing Black Buttes, Colfax Peak and Mt Baker. After a short time on the summit, we will retrace our steps back to the camp and continue down to trailhead. Group climbing equipment including: ropes, snow anchors, etc.